If you long for the beloved sandwich, you can now find it on Pizzeria Mozza’s late-night menu. 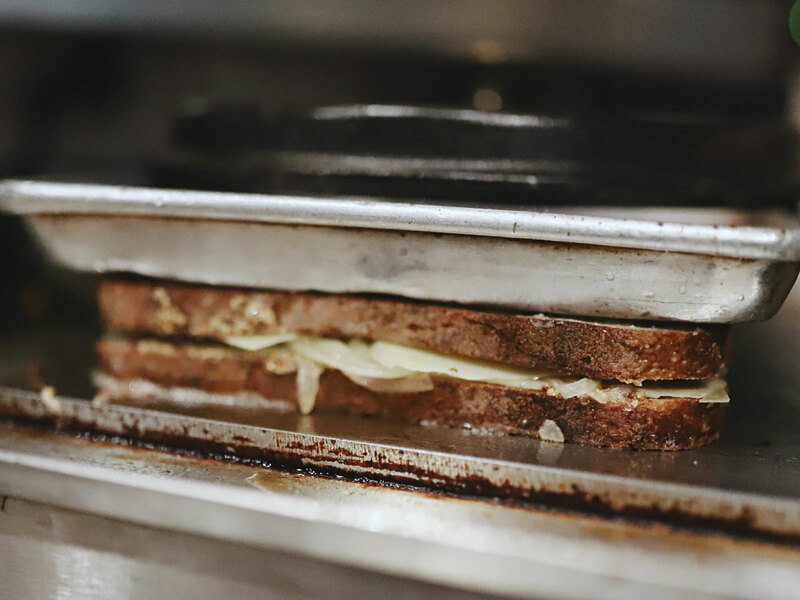 Nancy Silverton’s grilled cheese came back in a big way last week, and not even an intense day of rain could stop the madness. Last Thursday was a crazy rainy day in L.A., a day when Mayor Eric Garcetti, Los Angeles County, and the Los Angeles Times all tweeted tips about how to drive under such precarious circumstances. (One important tip: slow down.) It was a day where many Angelenos stayed home as much as possible. But in the evening, the skies had started to clear, and a lot of people went to Republique for dinner. 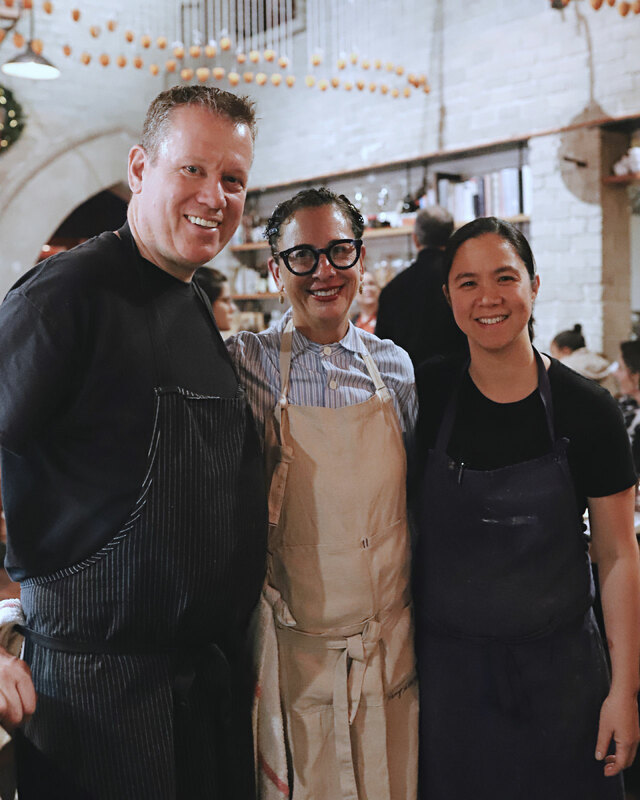 Chefs Walter and Margarita Manzke’s Republique is a glorious all-day restaurant and bakery that’s especially lively at night, when guests pack the house to enjoy dishes like foie gras torchon toast, Sonoma duck-leg confit, and mafaldine with Santa Barbara uni and Maine lobster. And there was some extra excitement last Thursday. The Manzkes were celebrating Republique’s fifth anniversary with a special guest: Silverton, who used to cook in this space when it was home to iconic restaurant Campanile. Last Thursday was a one-night resurrection of the legendary grilled cheese nights Silverton used to have at Campanile. So there she was behind the griddle at Republique, on a night when around 400 people came by for a $75 four-course meal headlined by her grilled cheese sandwiches. “We were definitely in it,” says Silverton, thinking about how she barely had time to look up from making sandwich after sandwich. She served the Campanile grilled cheese with cave-aged gruyere. She also made the dazzling Nancy’s grilled cheese with cave-aged gruyère, pickled onion, and mustard. The tanginess of the onion and mustard were a perfect complement to the richness of the melted gruyere. The third option from Silverton was Ruth’s grilled cheese, an homage to Ruth Reichl with Tillamook cheddar, onion, and bacon. Food media, industry guests, and VIP diners, including Martha Stewart, Phil Rosenthal, and James L. Brooks, were in every quadrant of the massive Republique. “This is a very special night,” a beaming Brooks said when we said hello. If you missed out on this dinner and are craving grilled cheese, we’re happy to report that Silverton is serving a snack-sized version of Ruth’s grilled cheese, laden with scallions and shallots, on her new late-night menu at Pizzeria Mozza. Available Sunday-through-Thursday from 10 p.m. to midnight, that sandwich is $8, or $9 if you want to add bacon. We ask Silverton, a day after the Republique madhouse, if she might add some other grilled cheeses at Pizzeria Mozza. Silverton launched her Campanile grilled cheese nights in the mid-1990s with modest expectations, but she ended up creating a sensation. She started serving grilled cheese at the fine-dining restaurant’s bar on Thursdays because she wanted to bring in business during a typically slower night and also to give guests a more accessible way to dine at Campanile. “I thought about what I loved to eat as that sort of craveable snack,” Silverton says. What she loved to eat was melted gruyère on great bread. So she started grilled cheese night with that and later added croque madames and croque monsieurs and the Nancy’s grilled cheese with pickled onion and mustard. A spicy sandwich with thinly sliced Italian meats was named "the Autostrada" because Silverton was inspired by the food at Italian highway rest stops. She did a lot of tartines because she realized that the open-faced structure meant she could have more topping combinations on two slices of bread. Silverton’s grilled cheeses were limited to guests who were at the bar or on the front patio, maybe 30 to 40 people at a time. The demand was huge, and Silverton found herself making 200 sandwiches a night. In the beginning, she thought she would be doing grilled cheese night by herself. A close friend with no restaurant experience, Caryl Kim (the owner of L.A. clothing store Noodle Stories), thought it would be fun to help out. So Silverton and Kim made sandwiches together under circumstances that weren’t exactly ideal. One part of the setup involved placing a sheet pan over the bar’s sink and then putting a sandwich press on top of that sheet pan. Somehow, this all led to Silverton publishing a book with sandwich recipes from Campanile’s Thursday nights. She’s now serving Ruth’s grilled cheese at Pizzeria Mozza because it’s an ideal late-night snack. Silverton likes the minced onions and how there are little pieces of bacon that aren’t overwhelming. And while she prefers how gruyère melts, cheddar works well on Ruth’s sandwich. “It’s just the perfect three-bite experience,” says Silverton, who also has pizzettas, wings, pancetta-wrapped chicken livers, meatball subs, and a half-order of her famous chopped salad on the late-night menu. When Silverton first opened Pizzeria Mozza in 2007, she knew she wanted to serve food until midnight. Knowing Silverton’s history, this might be the start of something big.